FAIRFAX, MN—Clutching a jagged hacksaw while staring unblinkingly from his black ski mask, a terrifying figure has reportedly been selling dead trees to passersby in the Fairfax Middle School parking lot for two weeks, sources confirmed Monday. 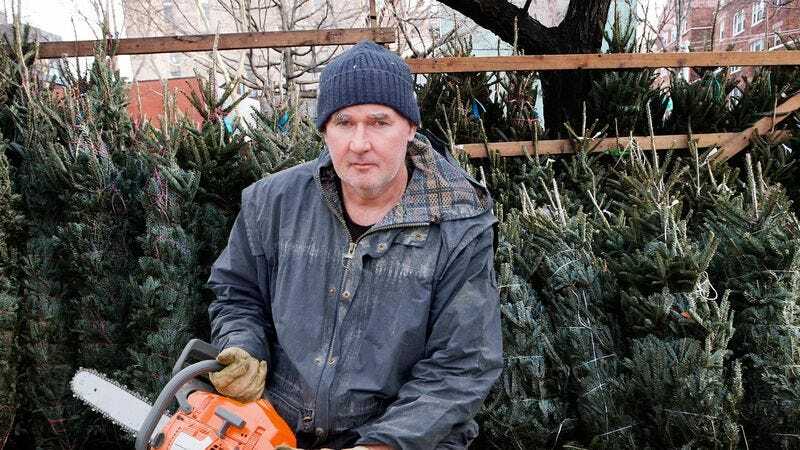 “Looking for a tree?” the hulking brute of a man said while pacing behind local residents as they traversed row upon row of evergreen cadavers, occasionally stopping to prop up a frozen tree’s corpse to allow visitors to gape at its lifeless form. “Like this one? Let me just cut off the bottom of its trunk for you real quick.” Sources confirmed that the fearsome beast then dragged the dead body of a pine tree to a nearby car, grunted audibly as he bound it tightly to the automobile’s roof with a length of twine, and then tried to sell onlookers a grisly, horrifying ring made from the severed, intertwined limbs of several gruesomely butchered firs.